but I've gotten better. Let me share with you how. Hearts separated now call to each other until the end of days. He is still with you and if you listen with your heart you can sense and feel him when he's near. He may be gone, but he will shine down on the darkest nights to guide you. Remember, with every touch of his hand, he left a part of himself with you that can never be taken away. He touched your heart and left an impression for all the world to see, and that's a beautiful thing. A hearts song goes on forever, in waves that never end, just waiting to be heard. He calls to you, "All is well", you can hear it on the waves. Memories may not be the same as having him near. Amazing memories, though, will get you through difficult times. Your grief may have caused your eyes to tear, but I can still see his love in them, and he is near. Hearts that were as close as yours become tangled together, they stretch to remain connected even when apart with a love as strong as yours. Below are Words of Sympathy and Encouragement found in the form of gifts; etched glass, heart shaped gift cases, etc. Enjoy. Walk Beside Me Reflection Frame "Those we love don't go away. They walk beside us every day." This beautiful sentiment is engraved on heavy weight glass in an attractive frame. 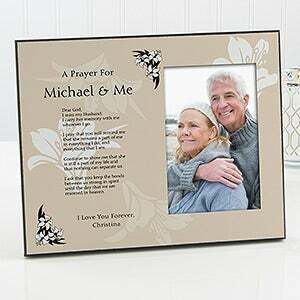 A Prayer For You And Me Memorial Frame Here's a prayer that offers a beautiful tribute to the memory of a departed love one. It helps a friend or relative put into words the feelings of a heartfelt loss, and is a reminder for them that that even though a person is no longer with them in a physical sense they will always remain a part of them - always. Here's what it looks like!